Rabat, Morocco – April 16, 2017: Klára Spilková became the first Czech player to win a Ladies European Tour event with a one stroke victory over Suzann Pettersen at the Lalla Meryem Cup in Morocco. The 22-year-old from Prague fired a final round of 66 on the Blue Course at Royal Golf Dar Es Salam – which tied the best round of the week with Georgia Hall – and came from four strokes back to claim her first win with a 72-hole total of eight-under-par 280. Overnight leader Pettersen had a 15-foot birdie putt to tie on the 18th green, but her effort came up just short. Spilková, who represented the Czech Republic in the Olympic Games in August, was meditating on the practice putting green when she learned the news and she said: "I'm so happy, it's crazy." This was her first start on the LET in 2017, although she warmed up with a fourth-place finish in the Terre Blanche Ladies Open on the LET Access Series last week. "I just took almost a two month break to work on myself more than anything else. I didn't play much golf. I was trying to get my mind in the right place and it worked. I feel much better than last year. The hardest challenge is always your ego. I just won for myself, because I felt no ego. I can't believe it. It's just great. I don't really have any emotions now." 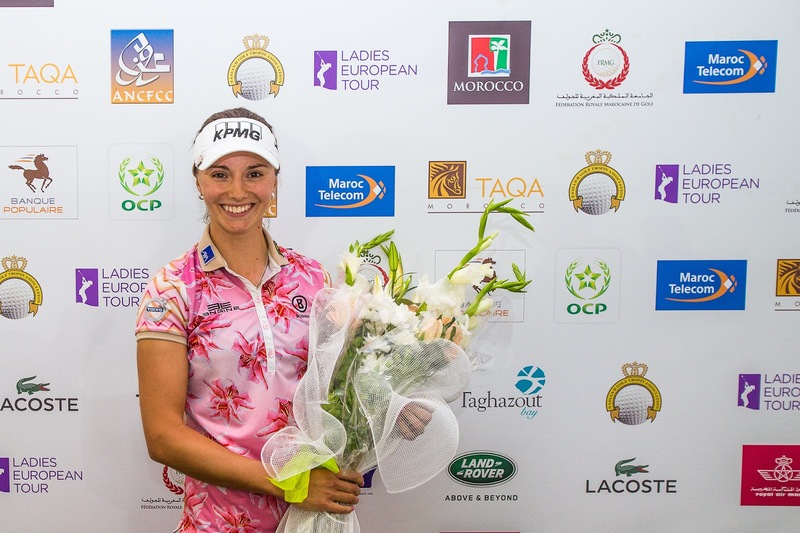 The seventh-year LET member first played in the tournament as a 16-year-old rookie in 2011, the year that her friend and mentor, Zuzana Kamasova, from Slovakia, won the title in Agadir to become the LET's first winner from Eastern Europe. Spilková said: "I was thinking about Zuzana as I walked down the 18th and I'm going to call her tonight." With a first prize cheque of 67,500 euros, she will now move to the top of the LET Order of Merit. Pettersen signed off with a 71. Having started the final round with a two-stroke lead, she was quickly caught by Annabel Dimmock, who birdied the first two holes to tie at six-under. The world number 17, Pettersen re-established her lead with a birdie on the long sixth, but then bogeyed the 10th and 15th. Spilková made her fifth birdie of the day at the 13th to tie for the lead and then made a birdie putt of six feet on hole-14 to grab a one stroke advantage. Pettersen made a long birdie putt on 17 but missed her chance at the final hole. She said: "Obviously I'm very disappointed not to win. I didn't have my best game from tee to green and it's cost me this tournament. I had a putt on the last, which ended short. It was in my hands to at least get into a play-off. I kept the hope alive with a birdie on 17 but when you shoot 66 on Sunday you should be there or thereabouts to win the tournament so credit to Spilkova." Dimmock signed off with a 70 to end in third place on six-under-par, while fellow Englishwoman Georgia Hall's 66 saw her tie for fourth with Felicity Johnson on four-under. Dimmock said: "I feel a bit disappointed but overall, I'm pleased with my week. I was pretty pleasantly surprised, but I got better every day with my swing. Even today, I didn't hit it well off the tee, but I didn't let it get me down. It was amazing for me to play with Suzann and I learned a lot and next time I'm in this situation I will be less nervous." There were also top-10 finishes for Karolin Lampert and Noora Tamminen, who were sixth and seventh respectively, while the defending champion Nuria Iturrios tied for eighth with Agathe Sauzon and Carly Booth. Sweden's Jenny Haglund was the best LET Rookie, in a tie for 11th position and the halfway leader Lydia Hall tied for 14th.